Just after Sarah dies, Rebecca’s birth is recorded, the only woman given this distinction in the Bible. It seems that the narrator wants to reassure the reader that the saga will continue. “Before the first matriarch died, the second is already born” (Teugel, p.92). But it is not just that she is mentioned, it is the way that her birth is recorded. The genealogical record lists Rebecca as the only progeny of Bethuel (22:23) even though very clearly she has a brother, Laban. Through the notice of her birth, Rebecca is being emphasized so that we understand that she will carry on Sarah’s role. The “birth announcement appears just after Abraham has been promised that his descendants will inherit their enemies’ gates (Gen. 22:17)…this is the very blessing that Rivka’s family bestows upon her as she leaves to marry Isaac (24:60). The one who will succeed Abraham in this role has just been born” (Frymer-Kensky, pp.5-6). After the death of Sarah we would expect the patriarchal narrative to follow the life of Isaac. “Instead, once again the accent is on the role of a woman, Rebekah. About Isaac, her husband, we are told little relating to the establishment of the religious faith” (Jeansonne, pp.54-55). It is “Rebekah who often plays the central role in the unfolding of events. It is she alone who receives a divine revelation that her sons will give rise to two nations, information to which her husband, Isaac, is not privy (Gen. 25:22-3). Moreover, it is Rebekah who is instrumental in determining which son will be the next recipient of the patriarchal promise and blessing. It is she who conceives the plan to dress Jacob up in Esau’s clothes…it is Rebekah who again takes control of events by engineering Jacob’s safe passage away from the vengeance of Esau who was intent upon killing him” (Davies, p.87). 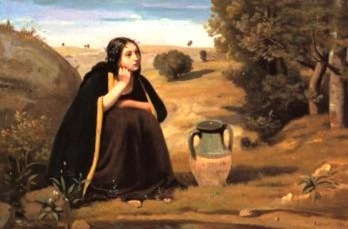 Even before we begin to learn the details of her life, the genealogical record was designed specifically to introduce her as the main character of Isaac’s story, an odd technique for a supposedly patriarchal narrative. “And if the woman is not willing to come after you, you are free of your oath. Just do not bring my son there” (Gen. 24:8). In his old age Abraham was left with one son holding God’s covenantal promise. Isaac was middle aged and unmarried. God’s chosen lineage seemed about to expire (again) even before it got going. In response, Abraham sent his senior servant to find the perfect woman for Isaac. She couldn’t be just any woman, otherwise God would have accepted as legitimate his other son, Ishmael’s family line. As I mentioned in my discussion about Sarah, perhaps Abraham was fulfilling her dying wish by sending his servant to find a woman from the “old country.” If Sarah had continued to practice matrilineal descent but had no girls to pass on her legacy, her next best option would have been to carefully choose the bride for her son. Perhaps Abraham was fulfilling Sarah’s orders when he insisted that Isaac obtain a wife from the house of his sister Milkah and Rebecca’s mother (Gen 24:25). Regardless of what Sarah might have wanted, God insisted that in order to be considered a primary heir, “a man must be the son of both a woman and a man within this patrilineage, as well as marry a woman descended from this patrilineage” (Steinberg, p.56). That certainly narrowed down the list of eligible maidens. Then Abraham restricted the list even further by requiring a robust and independent woman for his son. “Abraham has described the characteristics of an ideal woman for his son: she must be from the homeland and be willing to come. The servant wants more: she must be hospitable and strong” (Frymer- Kensky, p.8). The text emphasizes that the bride must be prepared to leave her family and her land just as Abraham had done. “In this Abraham attributes to the woman the ability to decide, not to her family. He decides for his son. As regards the woman he seeks, he assumes that she will do it and not her father. Abraham puts the woman on a level with himself, not with her future husband Isaac, for whom the decision is made” (Fischer, p.49). So the success of the Israelite nation-to-be hinges on one woman volunteering to begin a journey. “The maiden was very beautiful, a virgin whom no man had known. She went down to the spring, filled her jar, and came up” (Gen. 24:16). Fuchs argues that the story of Rebecca at the well is another demeaning tale about a biblical woman. “The value of the biblical bride is determined in purely androcentric terms–for instance, according to her virginity and good looks… Rebekah’s actions imply receptivity, acquiescence, and obedience” (Fuchs, Structure, p.47). This analysis overlooks the stipulation Abraham’s servant placed upon the proper choice for Isaac’s wife: “let the maiden to whom I say, ‘Please, lower your jar that I may drink,’ and who replied, ‘Drink, and I will also water your camels’–let her be the one You had decreed for Your servant Issac” (Gen. 24:14). If her only characteristics were her nubility and beauty, she would have failed the test Abraham’s servant laid out before her. It turned out that everything depended on her actions. Her actions spoke of a generous, independent and strong woman. “Ancient Near Eastern wells were not vertical shafts through which buckets are lowered by rope. They were inclined slopes that the girl went down and came up. To water ten camels after a along journey, Rivka has to go down and come up many times. It is no wonder that the servant watching her was astonished!” (Frymer-Kensky, p.7). Fuch’s characterization in this article ignores the initiative Rebecca showed in going above and beyond the call of duty in providing water and hospitality to her guest. “The maiden ran and told all this to her mother’s household” (Gen. 24:28). Abraham’s servant requested a place to stay in Rebecca’s father’s house but instead, Rebecca arranged matters with her mother’s household. The term “mother’s house” is found in the stories of Rebecca, Ruth and in the Song of Songs. Traditionally this has been interpreted to be a reference to a harem or the women’s quarters of the house. “None of these suggestions involves serious attention to the female perspective of the term’s context nor consideration of the possibility that bet em may itself be a technical term that serves as a counterpart to the far more common bet ab [father’s house]” (Meyers, p.40). The term “father’s house” refers to buildings, land, animals, people. The term also includes the concept of a kinship and lineage system. Its role is “the basic economic unit, producing virtually all of what was needed for the subsistence of its members…because it incorporates…the various functions of the household-residency, economic production, social activity, cultic practices, and so on” (Meyers, p.41). The “mother’s household” should be considered an analogous social structure to “father’s household” given that there is no evidence that the term should be treated differently. “‘This is from the Lord; we can say nothing for or against. Here is Rebekah herself’… They said, ‘Let us call the girl and see what she says.’ They called Rebekah and asked her if she would go with the man, and she said, ‘Yes, I will go'” (Gen. 24:50, 57). Rebecca’s decision attests to a certain degree of female autonomy in the early biblical world. “The presentation of Rebekah shows that women in Israel were viewed as persons who could make crucial decisions about their futures, whose prayers were acknowledged” (Jeansonne, p. 69). Interestingly, Rebecca’s choice is considered the scriptural source for the rabbinic ruling that a woman cannot be married without her consent. Rebecca was a second Abraham who also voluntarily left her home in Mesopotamia for the unknown land of Canaan. “Rivka is very much like Abraham. They are both models of hospitality, and the narrator of her story highlights her similarity to him by describing her actions toward the emissary in the same language that describes Abraham’s actions toward his angel visitors (Gen. 18:1-8)” (Frymer-Kensky, p. 14). Roth points out that various key words link Rebecca and Abraham. They both leave behind “their country,” “their kindred,” and “their father’s house.” Both will be “blessed” and “become great.” As Rebecca prepared to leave, her parents provided her with the same blessing given to Abraham (compare Gen. 22:17 with 24:60). From the very beginning it was Abraham’s desire to find someone other than Isaac to follow in his footsteps. Rebecca and Isaac met each other for the first time at the well of Beerlahairoi named by Hagar. After his father’s attempted sacrifice of him, Isaac separated from Abraham. It was here too that Isaac erected his mother’s tent and then consummated his marriage to Rebecca. “When Isaac brings Rebekah into ‘the tent of his mother Sarah,’ he accepts her as his partner as well as the matriarchal head of the family…Rebekah steps into Sarah’s place and carries on the matriarchal lineage” (Caspi/Havrelock, p.42). Teubal sees this as Rebecca’s induction into the same order of priestesses as was held by Sarah before her. “Although Rebekah makes a patrilocal marriage, Isaac provides a semblance of matrilocality by consummating his marriage to Rebekah in the tent of his mother…Sarah’s spiritual heritage would be continued through Rebekah” (Teubal, p.63). Whether or not Rebecca was a priestess, Isaac has certainly surrounded himself with both the physical presence and memory of strong women. As a female reader of the story, I am left with the impression that the Bible is interested in powerful women. Allen, Christine Garside – “Who Was Rebekah? ‘One Me Be the Curse, My Son! '” in Beyond Androcentrism: New Essays on Women and Religion, Rita M. Gross, ed. (Missoula, Mont. : Scholars Press, 1997) 183-216. Fass, D.E. – “Unbinding Mother Rebekah,” Judaism 41 (1992), 361-76. Meyers, Carol – “‘To Her Mother’s House’: Considering a Counterpart to the Israelite Bet ab” in The Bible and the Politics of Exegesis: Essays in Honor of Norman K. Gottwald, David Jobling, Peggy L. Day, and Gerald T. Sheppard, eds. (Sheppard. Cleveland: Pilgrim, 1991) 39-51. Teugels, Lieve – “A Strong Woman, Who Can Find? A Study of Characterization in Genesis 24” Journal for the Study of the Old Testament 63 (1994): 89-104.